Anita Goodesign 2 Day Event: "I Can Quilt 201" EARLY BIRD SPECIAL!! The bell is ringing now for the start of the newest class from Anita's University. "I Can Quilt 201." Continuing with the success of Anita's University class, "Embroidery Made Easy 101," we're proud to introduce and teach the next class in the series. During this class we will deep dive into each and every one of our quilting techniques. You'll learn how Anita Goodesign saves you time, money, and fabric with our innovative in-the-hoop quilting techniques. Whether you've attended Anita University 101, you'll benefit from the different designs, education, and projects in THIS new series of classes. Register before May 31st and receive TWO $10 Sew Right BONUS Cards. Classes take place at: Adria Hotel & Conference Center 221-17 Northern Blvd, Bayside, NY 11361 Free on-site parking available. You may have seen Missy at a sewing event somewhere around the country or perhaps on television or online. She travels the country teaching classes on sewing, serging, embroidery, and software for Baby Lock USA. This popular educator will be at Sew Right sharing her expertise with a serger trunk show on Friday and a ALL DAY hands-on class with the "Serge and Go Class Carry All" on Saturday. If you enroll for BOTH days, as a BONUS you will attend the trunk show for FREE ($49 value)! 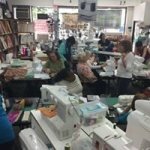 You may have seen Missy at a sewing event somewhere around the country or perhaps on television or online. She travels the country teaching classes on sewing, serging, embroidery, and software for Baby Lock USA. This popular educator will be at Sew Right sharing her expertise with a serger trunk show on Friday and a ALL DAY hands-on class with the "Serge and Go Class Carry All" on Saturday. If you enroll for BOTH days, you will attend the trunk show for FREE. Some beginner classes rush you through a couple of simple projects. When you then try to do it on your own, you're lost. At Sew Right we've been teaching beginners for years and have developed the right format so that you'll understand it and can go home and do it on your own. Ruth has been teaching people to sew for over 30 years! Here's a chance for a beginning sewer to kick things up a notch! Start with a super simple design and learn how to combine a variety of fabrics to create a patchwork jacket and/or use those decorative machine stitches with fancy thread or trims for a custom design with bling! (Soft fabrics with drape will work best). Take a piece of ordinary vinyl and transform it into an embossed leather look! Learn tips and techniques for using difficult fabrics-taking "OK" results into AMAZING results! Leave with a very high end looking journal cover that you have created using exclusive embroideries, optional feet, and decorative trims. If you're someone who gawks at the beautiful machine embroidery Sue regularly wears, it's time to pick her brain! She will go over how to place machine embroidery designs on denim: on the upper pocket and/or leg of a pair of jeans. There will be plenty of tips and tricks for other hard to reach areas. This is a lecture/demo. How do you place your embroidery design? There are several ways to do this. This lecture demo will explore the various positioning techniques, including the "snowmen" stickers. Together we can offer some tips and some tricks for this procedure. Class is for Baby Lock Embroidery Machine owners. Elaine has come up with a detailed traditional hands-on quilt project with a modern twist! This four month project has six different twelve inch traditional quilt blocks. This quilt uses six color ways with three shades of each hue to create a stunning quilt. There is an optional Kit available for $165.00. It includes the pattern and 21 different fabrics for the quilt top and must be preordered. If you want to create your own palette arrange an appointment with Elaine or Laurie. Explore your creativity with Judy Doenias! Once a month for four months we will meet (if you love it, we can continue beyond that time). Judy will present a challenge for you to explore during the upcoming month and ask you to present your results to the class on the following month. It can be based on a quilting design (e.g. log cabin, etc. ), it can be to explore a shape (e.g. squares, etc. ), it can be to create your own design based on simple parameters, or anything that your mind can conjure. If you are ready and willing to participate which includes doing your homework, this inspiring class will elevate your quilting experience. Fabric Collage- Hands On With Laurie Liang BACK BY POPULAR DEMAND!!! Laura Heine's collage quilts have received world-wide attention! Laurie will give you a taste of Laura Heine's collage techniques in this hands-on class. These quilts can be very impressionistic and painterly or structured in design. Students will have the choice of creating a pincushion or sea horse using Laura Heine's techniques. Please let Laurie know your preference. There are plenty of ways to approach the dreaded "y" seam, but sometimes you just have to bite the bullet and create one- or several! Laurie will review a few ways on how to tackle this seaming technique. Laurie has taken this stunning Block of the Month quilt and revised it so the top can be accomplished in 4 sessions. This colorful quilt is comprised of 12 diamond shapes nestled in a subtle background of stars. All you need are the Creative Grids 60 Degree Ruler, 6" x 24" ruler, and some fortitude! The Quilt Adventure discussing y-seams would be instructive prior to taking this class. Finished Quilt is 66" x 79"
Explore the fun and functionality of Baby Lock sergers as you create a cute microwaveable bowl. Light refreshments will be served. Learning new software can be challenging but Aarona will take you step by step through the process in this 3 session class. We will start with using the selection tool. Then move on to bringing in designs both from your computer and from the software. You will also leann how to save designs and move them around and add lettering to them. By the end of the 3 months, you should be more comfortable using the software to do basic editing. This class is FREE with the purchase of FTCU Software.